Camels are members of the family camelid which includes not only the dromedary and bactrian camels, but the "new world camels" which are the South American llama, alpaca, vicuna, and guanaco. 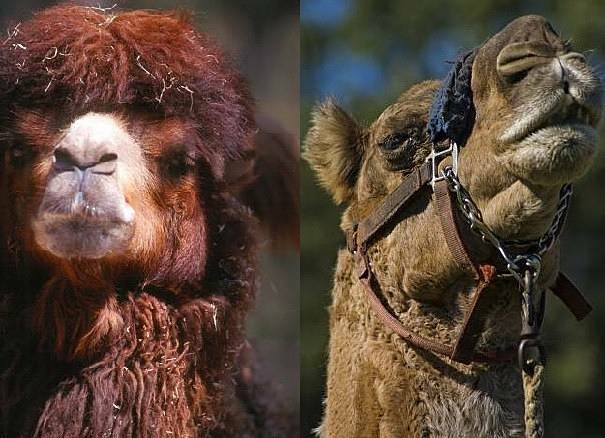 The "old world camels" are the dromedary and the bactrian, the only two members of the genus camelus or "True Camels". 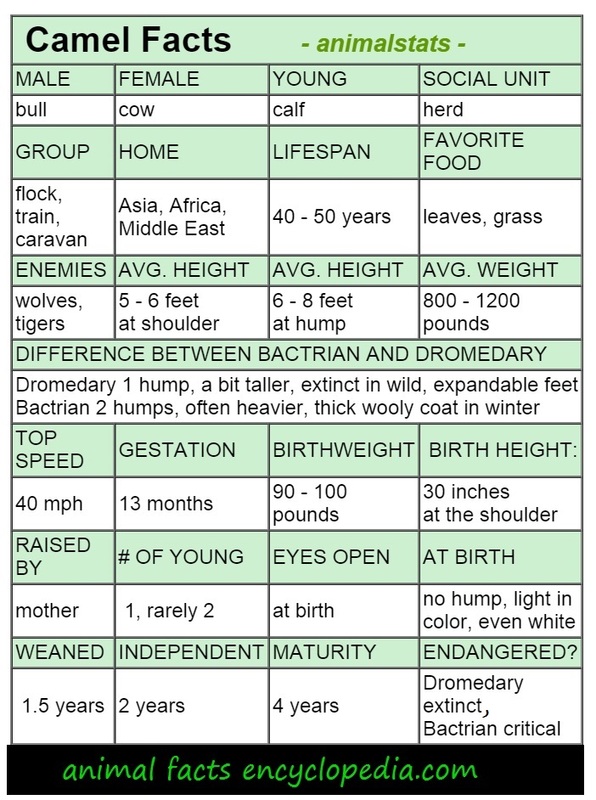 The dromedary has one hump, the bactrian has two. The simplest way to remember this is to imagine the first letter of those names capitalized and lying on their flat end. A capital "D" - a capitol "B" - one hump or two!. The bactrian camel is native to Asia and can be found on the border of Mongolia and China. Its range encompasses both desert and - surprisingly- snowy mountain ranges. The bactrian camel has been domesticated for over 5000 years and only about 1000 to 2000 individuals still exist in the wild. The dromedary camel has been extinct in the wild for several hundred years. There are no wild herds in existence in the native lands of the Middle East and Asia where they first came to be, but some escaped domestic animals roam Australia. It is estimated that the dromedary camel has been domesticated for perhaps 6000 years and has shaped the civilization of the entire world. Camels are very specialized animals. 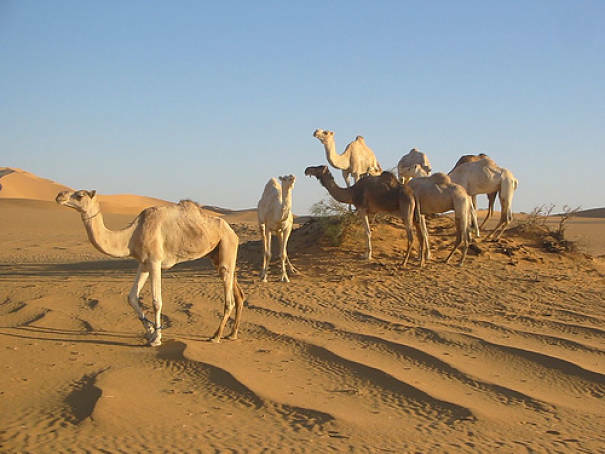 Their famous humps are stores not of water, but of fat (which, like all body tissue is largely water) and can sustain them without water for as long as a month in the harshest desert conditions. In an environment where most of the creatures are very small, do to such limited resources and the danger of exposure, the camel is a virtual giant, reaching well over 5 ft at the top of the head and weighing nearly 800 pounds. They maintain themselves in conditions that would kill nearly any other creature, with specialized expanding feet, nostrils they can open and close independently, lips that can chew thorns and even specially shaped blood cells. The red blood cells of camels are are not circular but oval shaped - unlike any other mammal on earth. The theory is that the oval shape allows blood to continue to circulate even if it is thickened from lack of hydration. When resources are scarce and a camel is living off the fat of its hump, the hump slowly deflates, and may even flop over, particularly in the bactrians, as the contents are depleted. And when a thirsty camel finally arrives at a water source it can easily drink up to 40 gallons in a matter of minutes. The flesh of the hump can be seen to visibly re inflate and even the hollows above the camels eyes will refill within a few moments of replenishing precious fluids. Perhaps most importantly, to the people who rely on these animals for their very existence, the camel holds a sacred space. 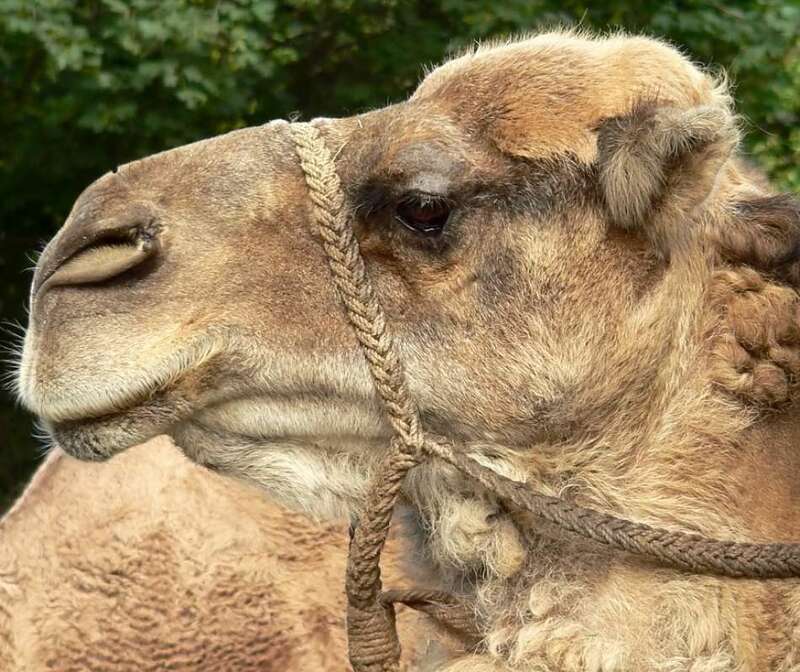 The camel is not the rude, vulgar and unruly creature of myth, but a stately, noble and amiable servant with some minor personality flaws and a wicked sense of humor. Camels were domesticated over 5000 years ago, and but for a handful of wild bactrians, only domestic camels remain. They have been used mainly as pack animals and for transportation. Their wool can be spun to make felt purses, hats and socks. Camel milk is a vital food source for the Bedouins and is a required ingredient in many native recipes. Camel meat is not as common a staple, but camels have been bred for their meat in the past and in some regions today. 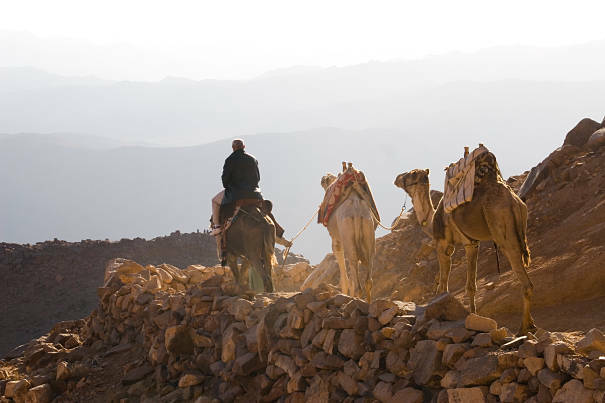 The first camel saddles date back to 1200 B.C. Camel cavalries have been used in many wars through history, and even the Romans rode camels during some of their African conquests. Camels were found to be useful against armies mounted on horseback because horses tend to be frightened of camels and opposing armies lost control of their mounts when a siege of camels approached. Camels are still used in many middle-eastern jurisdictions for border patrols and police duty. And the United States experimented with the idea of a U.S. Camel Corps, using camels as transportation in Texas, New Mexico and the Mojave desert in California in the 1850's. Many of these camels were released and some feral herds roamed the south western states for a few decades. Camels are also raised and trained for racing, particularly in Saudi Arabia, Egypt and the United Arab Emirates. It was a long tradition that children as young as six years old were used as jockeys, but child jockeys have recently become a human rights issue and several nations have banned the practice. Camels are ungulates similar to cows. They have 2 toes on their feet and so are described as "even toed ungulates". 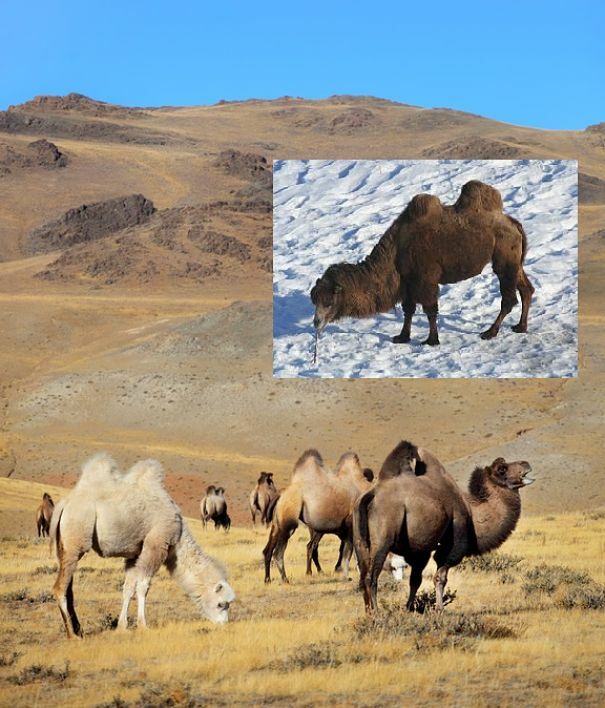 Wild bactrian camel herds can be as large as 60 individuals. They have a lifestyle typical of many herd animals with females maintaining relative harmony and males jousting for control of "harems." Males come into a seasonal heat called a "rut" where their testosterone level elevates. They will become unsettled and foam at the mouth. Because males in rut are difficult to handle and the rut may last as long as 4 months, most domestic male camels are gelded. Only the finest bulls remain intact and are able to reproduce. During the rut, males become single-minded attempting to dominate other males by proving their superiority in relatively civil contests. Neck wrestling, pushing and shoving, lots of bellowing but not allot of damage. The less dominant male will return to a band of "bachelor" camels while the dominant male currently in rut mates with the females in the harem. 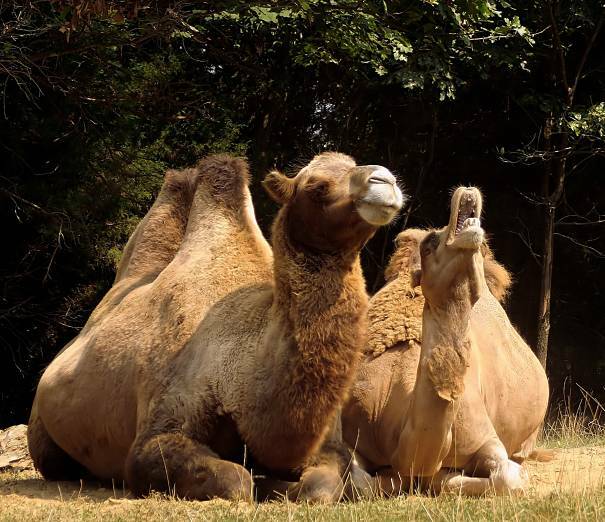 Males come into rut at different times and with varying intensity so the title of head camel changes hands several times during any one breeding season. The camel is a fascinating bundle of specific physical adaptions. These unique physical characteristics allow this massive animal to survive in a bare and exceedingly harsh environment. Most dromedary camels live in Africa's immense Sahara desert, where they withstand prolonged temperatures of over 120 degrees during the day, and overnight temps that may plummet to below freezing. The bactrian camel lives in the even more inhospitable Gobi desert and migrates up through the steppes of Mongolia. They withstand outrageous desert temperatures, but also regularly survive in snow covered mountains. A camel in the snow doesn't seem quite right, but when you are built for the conditions it's all automatic. To withstand both heat and cold, camels have a woolly coat of insulating fur. Although they will shed some of it in summer months it serves to keep out heat as well as cold. 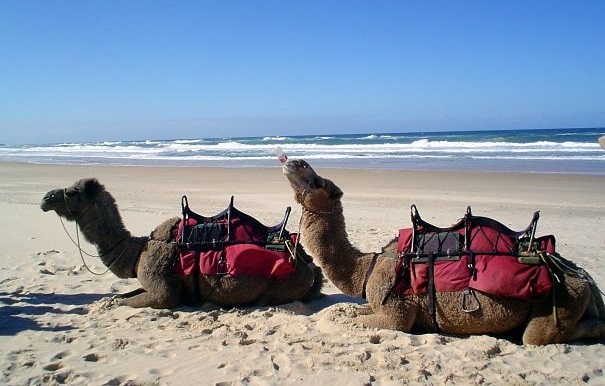 The camels humps actually help in regulating heat as well. With most of its fat stores in the hump, the rest of the body can cool off more easily. Naturally, the camels ability to live extended periods - sometimes months- without a drink of water is its most fascinating adaption. The hump is not an ideal source of hydration, as it takes energy for the body to get to the fat reserves and process them, but it is still the only animal with such capabilities. 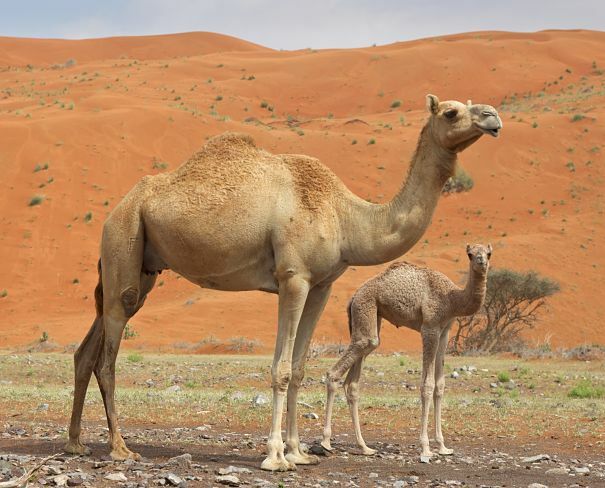 When you consider that a horse (even the desert barb and Arabian breeds) can't survive more than 4 or 5 days without water, the camels abilities are positively amazing. Camels even have specially shaped blood cells to keep blood circulating even when it thickens from dehydration. The camels body wastes no water. The camels urine is like a thick maple syrup, and its droppings are so dry they can be used within minutes of passing to start a campfire! Amazing Camel Facts. So let's just say that camels have a bit of a reputation. They grunt, swear and spit (although their "spit" is actually vomit) They have been seen on many a tourists vacation videos kicking, bucking, biting and even swatting innocent folks with their tail. They are incredibly loud and will voice their objections with thundering groans and rolling eyes. They are odorous, belching and passing gas with musical regularity. They may not be the most attractive animal that made it to the ark, though they often possess a regal expression. But those who know the camel best - the Bedouin people of Africa, and the Khalka people of Mongolia - hold these creatures very dear. 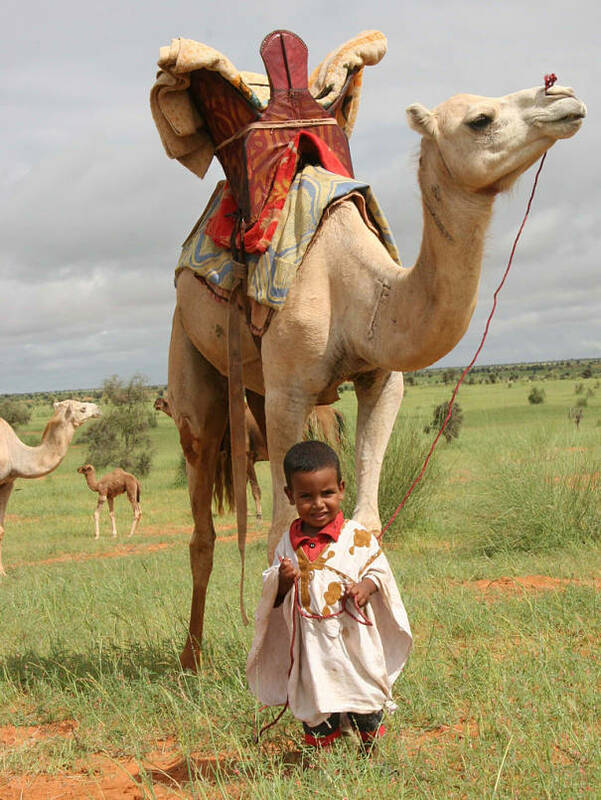 Camels are vital to these mostly nomadic peoples existence. They are considered members of the family and treated with great respect. The typical domestic camel can understand hundreds of words and dozens of specific requests. They know the difference between right and left, will lift each of their feet on command, open their mouths if requested, lower their heads to be bridled, lower themselves to their knees to be mounted. They are broken to a halter and saddle within a few months old, and are large enough for weight bearing by the time they turn one year old. Mothers and calves may be separated out of necessity, but often live together in service to the same human family for life. The camels medium speed is a "pace" which moves both legs on the same side . 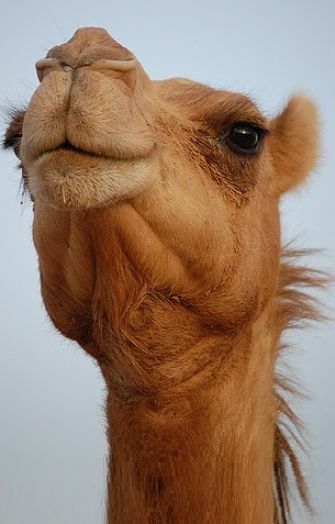 There are over 150 Arabic words for "camel"
The camel is known as the "Ship of the Desert"
The word "camel" comes from a Latin root meaning "to carry" but the Hebrew term "gamal" may also have some impact - it means "to go without"- Camel Facts!